In the months since Occupy Wall Street pitched its first tents last September, one criticism of the movement has been that it does not offer much in the way of solutions. Enter Occupy the SEC, an Occupy offshoot made up of activists and veterans of the financial sector. Instead of taking the public stand of OWS, they’re using a different tactic: They’ve written a detailed 325-page analysis of the Volcker rule. And, in my view, they’ve got it exactly right. First, some background. 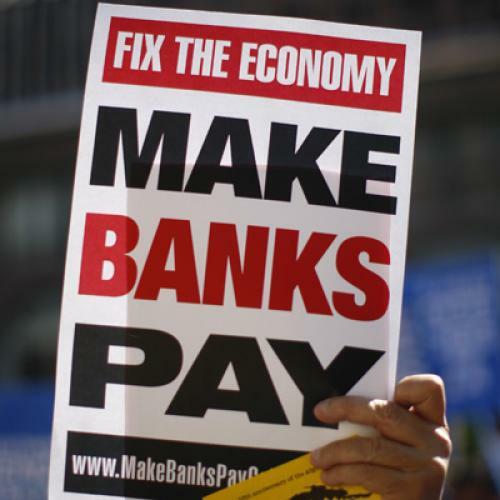 The Volcker rule, one of the key sections of the Dodd-Frank financial reform bill, prohibits banks or bank-holding companies from proprietary trading—that is to say, trading their profits (“their own book,” in bank-speak) in financial markets. The idea behind it is actually pretty simple. Commercial bank accounts are insured by the federal government through the Federal Deposit Insurance Corporation, putting taxpayers on the hook when a bank fails. So if you’re a lending institution and you leverage up and speculate, the rest of us may have to bail you out. That creates a dangerous moral hazard: personalized profits for the bankers when things go well; socialized losses for the rest of us when things go badly. The Volcker rule—like the Glass-Steagall law that played a similar role from the 1930s through the 1990s—is designed to curb this risk. This is where Occupy the SEC comes in. During the comment period for the Volcker rule—when regulators give outsiders a chance to weigh in on rules—these occupiers submitted a letter to the Securities and Exchange Commission, the Federal Deposit Insurance Corporation, and the Federal Reserve Board. The letter analyzes the Volcker rule line by line and urges the regulators, with great clarity and passion, to avoid gutting the regulations. The letter is long, but can be boiled down to a few main points: Keep the regulations simple with few exemptions, delineate very clear definitions of what’s allowed and what isn’t, and enforce real penalties for breaking the rule. The Volcker Rule does not prohibit proprietary trading activities outright. Rather, the Rule only restricts banks that have an implicit government insurance policy from engaging in such activities. The “invisible hand of the free market,” that darling cherub of neoliberal economics, will likely push much of the current proprietary trading into the folds of hedge funds or traditional investment banks, not eliminate them outright (assuming, of course, that such activities actually add productive value to the economy). The Volcker Rule simply removes the government’s all-too-visible hand from underneath the pampered haunches of banking conglomerates. Such regulations may, no doubt, be considered as in some respects a violation of natural liberty. But these exertions of the natural liberty of a few individuals, which might endanger the security of the whole society are, and ought to be, restrained by the laws of all governments. … The obligation of building party walls, in order to prevent the communication of fire, is a violation of natural liberty, exactly of the same kind with the regulations of the banking trade which are here proposed. That’s right, folks. Adam Smith recognized that someday we’d need Dodd-Frank financial reform, of which the Volcker rule is a very important part. He probably also realized that bankers and their agents would try to kill it—and what’s scary is that they may well succeed. Unless, that is, those in seats of power listen carefully to Occupy the SEC. Jared Bernstein is a senior fellow at the Center on Budget and Policy Priorities and the former chief economist to Vice President Biden. He hosts jaredbernsteinblog.com.